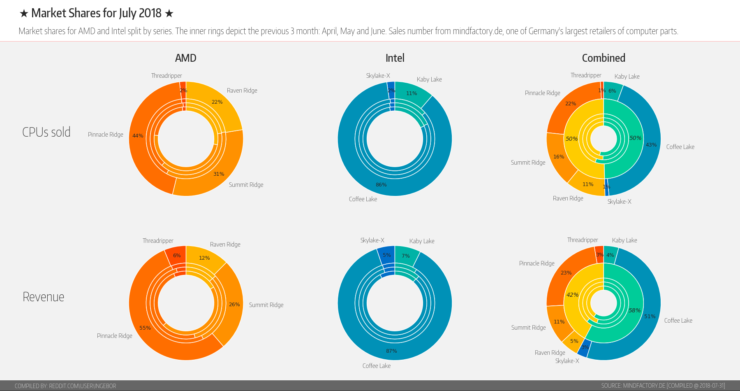 The latest CPU market share and revenue report have been released by Germany’s biggest retailer, Mindfactory, for the month of July. According to the report, AMD Ryzen CPUs have reported higher market share than the previous month, surpassing Intel after months of 8th generation lineup dominance. For months, Intel’s 8th generation processors dominated the market with strong sales within the mainstream segment. AMD launched their 2nd generation Ryzen platform earlier this year and it has since played catch up to Intel’s 8th generation family that launched the previous year. Finally, AMD Ryzen processors are now witnessing strong sales, leading to a significant jump in market share. According to the latest charts compiled by Ingebor at Reddit, both AMD and Intel hold a market share of 50%. The CPU market share is for the number of processors sold by the retailer and it slightly falls in favor of AMD CPUs which are ahead in the total number of processors sold. That said, Intel still maintains their position, which is also better than the previous month. 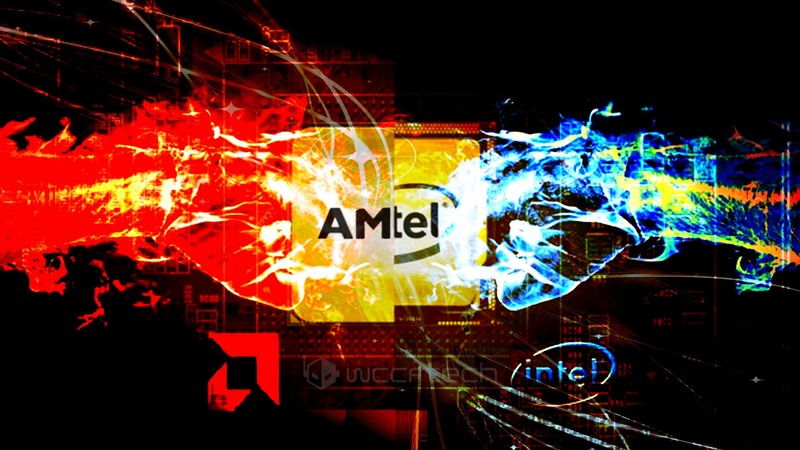 Both AMD and Intel CPUs account for around 8000 CPUs sold (each). In the previous month, Intel CPUs were slightly behind by a few hundred while the total number of AMD CPUs sold were around 6000. In terms of revenue made from the CPU sales, Intel chips accounted for a total of 58% (~1,900,000 EUROS) while AMD chips accounted for a total of 42% (1,400,000 EUROS). 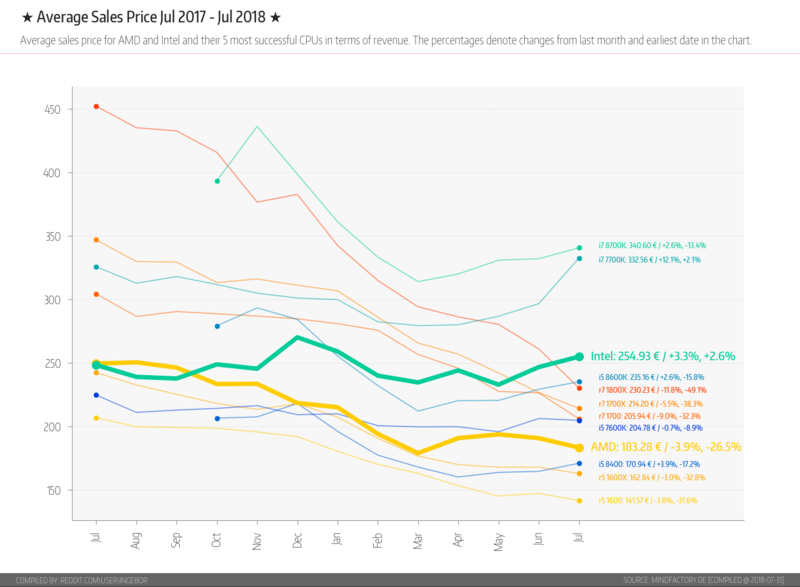 Both Intel and AMD saw reported for increased revenue from processor sales but the thing to note is that the AMD sales jump isn’t represented in the revenue made by the retailer. The reason behind this is that many AMD Ryzen processors, including first and second generation, have been on sale on discounted prices since their launch. So they won’t end up providing as much revenue as they would have on launch. Intel, on the other hand, has maintained their prices but we can expect their price cuts to be coming in shortly as they prepare to launch the 9th generation processor lineup. Out of the 50 percent of AMD CPUs sold, 44% are Pinnacle-Ridge based while Summit Ridge accounts for 31% of CPUs and Raven Ridge accounts for 22% of CPUs sold during July. On the Intel front, Coffee Lake amounts to 86% of the CPUs sold which is quite staggering, while Kaby Lake accounts for only 11%. Intel also leads with the most CPU revenue since their top end i7-8700K remains the most popular chip on the market. Interestingly, both Intel HEDT and AMD HEDT platforms account for only 2% of the share in the number of CPUs sold while revenue of the X299 HEDT chips is at 5% compared to 6% of Ryzen Threadripper. We can see the market shake-up in a few months when AMD and Intel introduce their new Ryzen Threadripper and Core-X series processors for the high-end desktop market and 9th generation desktop processors for the mainstream platform.